Essentials for traveling with pets! Make sure your pet has a body harness or snug-fitting collar on with ID tags! Just in case your pet gets loose, proper ID will help give him the best chance of getting back to you! Bring a sturdy leash as well. It’s important you have your dog leashed at any rest stop to keep him safe. Always have bottled water on hand and a portable water bowl helps! I once forgot the bottled water on an 8-hour car trip with my 3 dogs and it was HOT out. We had air conditioning in the car, but stopping to run into a store with 3 dogs in a hot car did not feel like a good option….thank goodness for drive-thru restaurants and nice attendants giving me extra drinking cups with water! Do your pets get car sick? Yup, mine did! 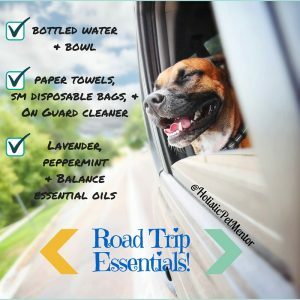 I learned this lesson before I had essential oils to help with car sickness…always bring paper towels when traveling with pets…and a plastic bags…and a non-toxic cleaner. My favorite cleaner to travel with in my On Guard Cleaner, of course! That stuff seriously works for every surface! Last essentials, but certainly not least are these essential oils by doTERRA: lavender (for all things calming), peppermint (for car sick dogs) or Digest Zen Touch (for car sick cats), and Balance Essential oil blend (for grounding and calming nerves). The lavender is wonderful for calming pets. One drop on the seat next to your pet may be just enough to help them stay calm during the ride. The peppermint and Digest Zen can really help support the digestive tract and ease those feelings of nausea. One drop is all you need! Put 1 drop in your hands (add a couple drops of fractionated coconut oil), rub hands together and lightly rub your pets belly…yes, it’s truly that easy! As for the Balance blend…well, its terrific for both cats and dogs, but I was actually suggesting it for YOU. Traffic can be interesting at times and I know how my nerves feel after several hours of driving. Let’s just say Balance is my “Tame the Road Rage” blend! If you are traveling with your cat, keep him or her in the carrier when you are driving. It gets complicated driving when a scared cat crawls by the gas and brake pedals! I take a small litter pan, with just 1 cup or so of cat litter in it, in case my cat needs a potty break. I have the litter pan on the floor in the back seat, then let him out of his carrier when I stop for gas or food. So there you have it! Pack these essentials and you will be a master at traveling with your pets!